How to Dress Like Peter Pevensie in "The Lion the Witch and the Wardrobe"
Here is how to dress like Peter Pevensie in the movie "The Lion, the Witch and the Wardrobe", based on the book with the same name by C.S. Lewis. Peter's Bomb Shelter Outfit In the London bombing sequence, Peter wears dark trousers, a light blue Oxford shirt, and a long-sleeved v-neck pull-over sweater,The sweater is light blue, with a decorative knit stripe of alternating cream and red, about two inches thick and a few inches up from the edge of the sweater. Two stripes, a smaller version of the stripe at the body, are on the forearm of the sleeve. 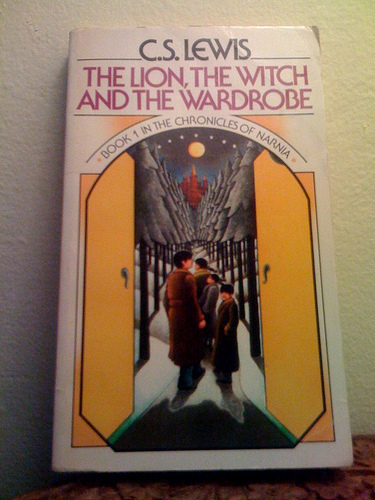 These clothes are worn when the children take leave of their mother, arrive at the Professor's house, and later when Peter is comforting Lucy,His long trousers are a navy blue, his shirt a light blue cotton Oxford,Worn over it and under his coat is a pullover v-neck sweater vest, cream colored with a knitted pattern in shades of blue, cream, and black,His dark grey pea coat is double-breasted, with his large tag pinned on front,It's almost knee-length,There are no cuffs at the wrist. Peter's Hide and Seek Clothes This outfit is very similar to Peter's other British clothes, consisting of a plain Oxford shirt and dark trousers with braces. The coat has a notched lapel and three flap-pockets: one on the left side and two on the right. The collar and pockets are top-stitched. The fabric is a herringbone eave.Somewhat ill-fitting in general, the sleeves only come to his wrist. Such ill-fitting garments suggest a growth spurt, perhaps intended to emphasize Peter's role as a boy-becoming-man. you can buy Peter's narnian armor at Halloween stores. Peter's coronation tunic is of a rich blue velvet. It ends about halfway to knee-length.The mandarin collar has a single curved oak leaf embroidered in gold on either side. The collar is made up of two self-lined pieces that curve down the neck at the back, overlapping. the satin-stitched embroidery on the front is metallic gold,The sleeves are eased and set in, flat-lined in a pale blue satin (same as undersleeve fabric). The velvet is turned under about a 1/4".They're not quite full length. They split on the outer part of the arm, up to the elbow, with curved edges. Lined in a pale blue satin (the same as the undersleeve), the velvet turns under about 1/4" over the lining. The sleeve split is bordered a 1/4" from the hem edge in a 1/4" yellow flat braid.The tunic splits up the front to within a couple inches of the waist, cased in a yellow binding that extends down and around the band of yellow satin at the the hem. The two-inch band is also decorated in cord: it's "filled in" with diagonally placed strips of cord, leaning towards the center on either side of the slit. The band is finished off by the same cord bordering the top edge, just slightly lower than the band/tunic seam.The waist is belted with two thin twisted yellow-gold cords,I can see the blue satin undersleeves, and under the hem of the velvet tunic The sleeves are probably gathered and set in, very loose, and are gathered into a fitted cuff. On the underside of the cuff are four self-fabric buttons.His bright yellow cape looks like a short pile panné velvet, lined in a paler yellow cream satin. The velvet is simply turned under an inch, and the edge of the cape has a twisted gold cord either stitched into the seam there or handstitched. The back of the cape is embossed with approximately one-inch designs. He wears pale cream yellow hose, the same color as the cape lining. His almost knee-high blue boots are covered in the same blue velvet as his tunic, slit at the back a few inches long and turned down the same amount, edged doubly with the flat yellow cord from the hem of the tunic, the inner strand of which loops at the right angle of the slit and continues up.The boots likely lace up the back under the slit.